This hand-forged ironwork range is made by Tom Chambers which are widely and quite renowned for traditional styled ironwork which is hand crafted from steel and hand welded to produce a superb long lasting product. This range of window boxes, hanging baskets and wall baskets come complete with quality coir liners. These Window boxes and gardening planters have decorative features including twisted front bars. All these hanging baskets, window boxes and wall baskets have a PVC coating to withstand all weather conditions. The hanging baskets come with heavy duty 4 link chains. 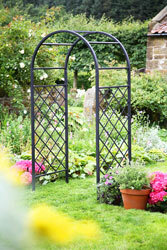 This range of gardening baskets are Top Quality. 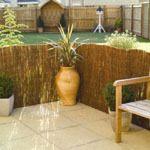 Top quality with coir liner included and heavy duty hanging chain. PVC coated to withstand all weather conditions. Please note wall bracket not included. RRP £12.99 - Our Price £11.99. Replacement basket liner for Hanging basket - Hand Forged 30cm diameter. Natural basket liner pre moulded simply drop into basket and plant up. These coir liners are strong and long lasting. RRP £14.99 - Our Price £13.99. Replacement basket liner for Hanging basket - Hand Forged 35cm diameter. RRP £17.99 - Our Price £16.99. 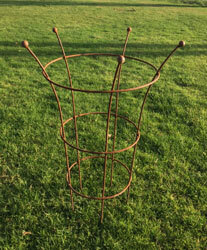 Replacement basket liner for Hanging basket - Hand Forged 40cm diameter. 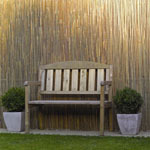 Top quality with coir liner included. 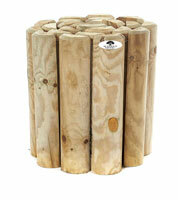 RRP 17.99 - Our Price £15.99. Replacement basket liner for Window Box - Hand Forged 50cm. RRP £22.99 - Our Price £20.99. Replacement basket liner for Window Box - Hand Forged 60cm. RRP £27.99 - Our Price £25.99. Replacement basket liner for Window Box - Hand Forged 75cm. 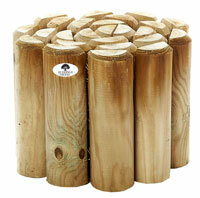 RRP £33.99 - Our Price £30.99. Replacement basket liner for Window Box - Hand Forged 90cm. RRP £39.99 - Our Price £36.99. Replacement basket liner for Window Box - Hand Forged 100cm. 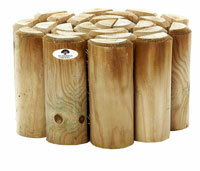 RRP £15.99 - Our Price £14.99. Replacement basket liner for Wall Basket - Hand Forged 40cm. RRP £23.99 - Our Price £21.99. Replacement basket liner for Wall Basket - Hand Forged 50cm. RRP £32.99 - Our Price £29.99. Replacement basket liner for Wall Basket - Hand Forged 65cm.